While you are cooking something, you need to out the exact amount of oil. Doesn’t matter if it is for cooking or baking purposes. This is the main reason you should be using oil sprayer. Here, I have collected the best olive oil sprayer you should use for your kitchen. The listed olive oil sprayers are checked by reliability and usability. We also checked the materials used in the sprayers, so it won’t harm you in any way. Before we get into the top list, Let’s see why you should be using an oil mister or an oil sprayer. Why you should use Oil Sprayer? Economy Friendly: Most of the time when we pour oil, we use more amount of oil than needed. This sprayers converts the oil into droplets and spread all over the food making it delicious. Therefore, it is economy friendly as it uses less oil. Healthy food: All the Olive oil sprayers listed below are made of food-safe material and BPA free. BPA means bisphenol A and is the type of chemical used in plastic and harmful for the body. Fewer Calories: Using the sprayer, you will use less amount of oil than usual and hence fewer calories in your diet. Clean Kitchen: You won’t spill oil and make a mess if you are using this oil sprayer. 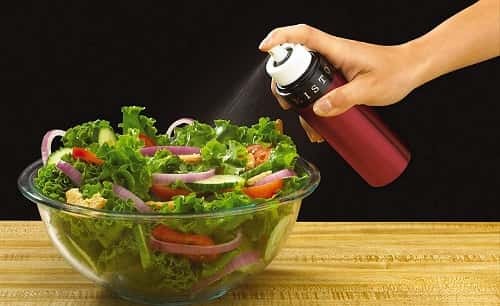 Just fill in the bottle and spray it on the food. Easier to use: All the Sprayers works on just pump and spray. You can use it. Even cleaning of these sprayers is easy. Most of the sprayer can be washed by hand or cloths. Doesn’t spoil your food: By the use of the sprayer, there is very less chance your food with getting oily and messy. It sprays a little amount on each trigger making it easier to control the oil. Check out our list of top 10 best olive oil Sprayers and select your favorite one. 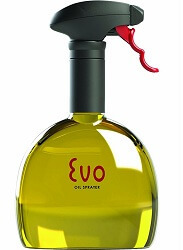 The first in the list of the best oil mister is Evo Oil Sprayer Bottle. With 18 Ounce Capacity, Evo Non-Aerosol Oil Sprayer is best for your kitchen. The beautifully designed oil sprayer dispenses 1.35 ml every time the trigger is pulled. Evo Non-Aerosol Oil Sprayer dispenses all types of cooking oil as well as vinegar in a fan pattern without any kind of harmful propellants or chemicals. It dispenses 1.35-milliliters on every trigger pull. The area spread is more and less oil is used. Easy filling and refilling are done just by a twist-on funnel. The second in the list is Misto Aluminum Bottle Oil Sprayer. It is one of the best selling product in Amazon. It is a non-aerosol oil sprayer and is BPA free. Also, it uses no chemical and is economically friendly. It is a non-aerosol oil sprayer hence BPA free. It can spray a variety of oils. 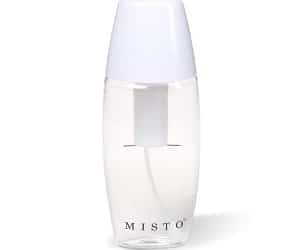 Misto Aluminum Bottle Oil Sprayer produces even, pure mist. You can refill and reuse the olive oil sprayer anytime. It is easy to use. 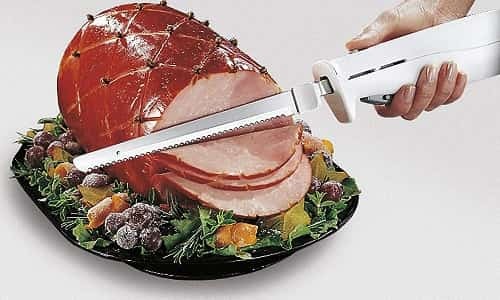 Easy fillings and refilling and sprayed easily. Premium Olive oil mister by chefvantage is a stainless steel sprayer. You can add fresh herbs or any kind of oil, it won’t clog. It is a clog free oil sprayer. It is one of the best alternatives for all of your cooking sprays. The practical and elegant design make it look simple and cool. It comes with an anti-clog filter, So it won’t clog. You can even add herbs to infuse your oil or vinegar. It is all in one alternative for all your cooking sprays. You can add any type o foil in Premium Olive oil mister by chefvantage. It has a non-aerosol air pressure pump mechanism which makes it super easy to use. 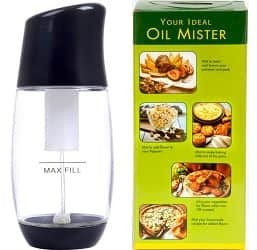 Healthier and easy to use oil mister. As the name says it is one of the ideal and best olive oil sprayer. 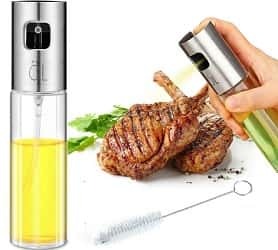 It is an ideal sprayer for cooking, grilling etc. 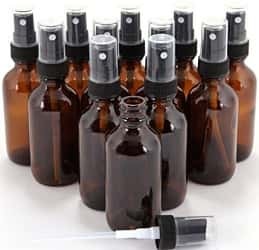 It is a healthier alternative to the sprays in the market. It is a clog-free mister and comes in many colors. It can be used with any type of oil including olive oil, lemon juice, vinegar, sesame oil and more. The mister helps you in pouring the exact amount of oil you need. You can maintain your calories. 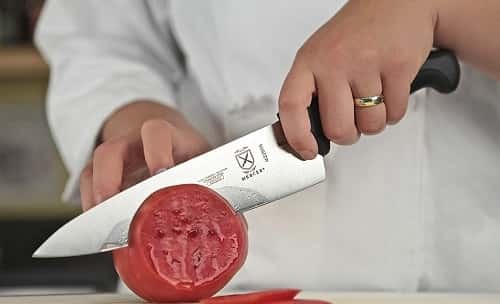 It is lightweight product made with food safe material. Despite being lightweight, it won’t easily break or leak. Easy to refill and reuse. Koopower Olive Oil Sprayer comes 5th in the list of best olive oil sprayers. It produces a super fine mist and is made up to stainless steel. It can be used for BBQ, cooking, baking etc. It is versatile and vinegar, juice, wine, etc can be used. It is very much useful in BBQ and salad. It produces super fine mist. It ensures coverage and less extra dressing. 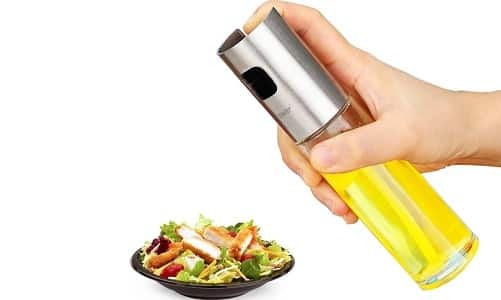 Koopower Olive oil sprayer is BPA free. It is also eco-friendly and can be used for healthier food. This mister is made up of transparent glass pot and easy to use. If you are looking for a lower budget sprayer, Misto Aluminum Olive Oil Sprayer will be the best option. Misto sprayers are best in the market. This is another lower budget Olive oil sprayer. BPA free. It is a non-aerosol oil sprayer. Almost all types of oil can be used. If you are looking for the simple glass bottle, this product is perfect for you. 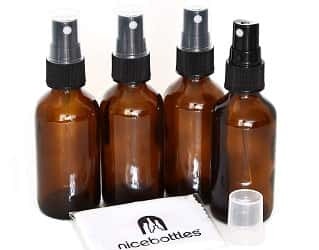 It comes with 2 Oz Amber Boston Round bottle with Fine Mist Sprayer. It comes in a pack of 4. 4 bottles in 1. Each of capacity of 2 Oz. It can be used in any type of liquid and oil. Easier to carry hence beneficial for traveling and picnic. It Also has1 Handy NiceBottles Advanced Micro-fiber Glass Cleaning Cloth with it. The GPS DP-1G-AMBER-FMS Amber Boston comes in Round Glass Bottle with Fine Mist Sprayer. It is simple glass bottle. It comes with 12 peices with the capacity of 1 oz each. It comes with Amber Boston round glass bottle. The capacity is 1 oz each. It has a fine mist sprayer. The simple and easy to use the economy friendly sprayer. In the Amazon product, the sprayer is shown short but in reality, it is longer. From the bestseller, misto, this one is another oval shaped sprayer. Easy to use. Just pump and spray. You can fill it oils or vinegar. It is eco-friendly and saves your oil by using it less. The last sprayer in our list is Oil Sprayer by SCWYF. This 3.42-Ounce Capacity sprayer made up of a glass bottle can be used for Olive oil, BBQ and vinegar. 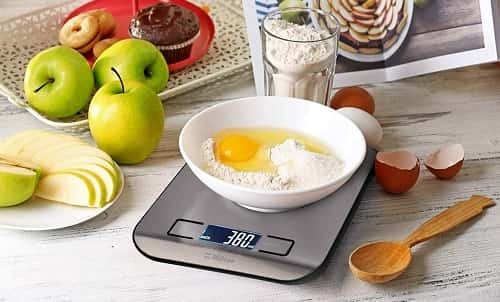 It is ideal for cooking and baking purposes. You can use olive oils, sunflower oil, lemon and lime juice, sherry, or marsala wine in this sprayer. It has a capacity of 3.42 Ounce. It is made up of safe materials for food and scratch-resistant glass. The sprayer is BPA free as well as Eco- friendly. It produces a fine mist. Easy to use and compatible. It can be used while traveling and picnic due to its handy design. Olive oil sprayer is a convenient oil mister which is used to grease pans, coating dough balls, dressing a salad and greasing skillets. Oil sprayer is very useful as you have the flexibility to spray the right amount with even distribution. 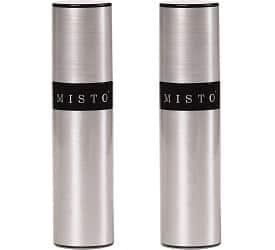 When looking for an olive oil mister, metal canister is known best for its durability to hold the aerosol oil. You get the oil spray in metal, plastic and glass wear. If you are looking for appealing looks then glass oil sprayer is a classy option. If the usage of oil sprayer is rare then plastic oil sprayer is less pricey and handy. The olive oil sprayer is usually filled with aerosol which dispenses the oil like a cloud of air. Always look for an oil sprayer that dispenses oil in fine stream without much spatting all over. Since the oil sprayer is not for a long-term use, the size chosen should be moderate and not overboard. Also, keep in mind that the oil sprayer is aerosol and will lose its air with frequent use. Usually most of the olive oil spray come in two pack. It is good to buy a 2 pack as one will help in case the other runs out of oil and you will know when to buy the second set. Design – Design and shape of the oil sprayer is very important if it’s for professional baker or to display on a party table. For a professional baker or chef the design should be ergonomic to avoid any stress to the hand while spraying the oil. Hence, choose the sprayer accordingly. Check for diameter and length of the oil sprayer if you are a frequent user. Brand – Choosing the right brand is important as some brands advertise well but when used the oil dispenses just like a jet of oil and not a fine stream. It is important to read the reviews before buying any product. Also, check for the expiry date depending on how long you intend to use it. Also, ensure to check for the ingredients for aerosol unit for its durability and chemical composition. Before you use the oil sprayer, pump it at least 10-15 times to get the best effect. It provides great result if tilted to 45 degrees angle and sprayed on skillet or pan. It is always hard to determine how much of the oil is left in the sprayer can. A small tip is to shake the oil sprayer to guesstimate the amount of oil left. After each use of oil sprayer, loosen the screw to release any remaining air pressure in the container. Fill the bottle with hot water and use one drop of liquid detergent. Rest it for a while and rinse with hot water. 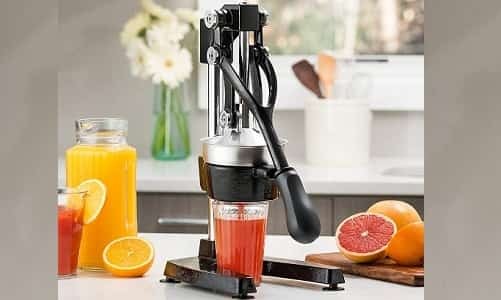 If you are using reusable oil mister for olive oil sprayer then you get to refill the tank with half oil and remaining half is required for the air pressure to build up when the oil tank is pumped up. It is recommended to clean the oil sprayer every month to have more effective performance. If the oil sprayer is made of glass make sure to keep it safe and avoid any accidents. If the oil sprayer is made of metal, make sure to keep it away from flammable items. Always remember aerosol is highly flammable and hence should be kept way away from kitchen stove. Always make sure to store the olive oil sprayer in a cooler environment as high temperature will effect the dispense of oil and may make the sprayer greasy and messy. Price – The price of the olive oil sprayer ranges from 8$ to 12$ Rupees for 200 ml bottle. Usually a 200 ml bottle will give 450 to 500 sprays. Finally, If you want a perfect olive oil spray, choose a proper brand and look for all the dimensions and requirements as discussed above. A good olive oil sprayer can make the bread rolls taste better. It is always the right amount of oil intake that keeps people stay healthy. I hope the above instructions will help you choose the olive oil sprayer per your requirements. To summarize, this was our list of top 10 best olive oil sprayers and misters. You can select any one as per your choice. Buy one of this sprayer now and start eating healthy and make your kitchen clean. For clean kitchen, healthy diet and to control your costs, you should definitely use one of these olive oil sprayers. You can use them for all type of oils and vinegar. Start controlling the oil and live a healthy life.